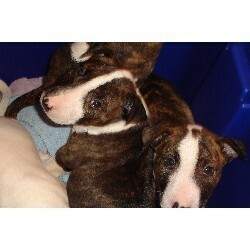 English Bull Terriers – Our English Bull Terriers are cared for with lots of love and attention. All of our dogs have plenty of room to run outdoors, and are raised indoors as part of the family in a great environment. This helps them acquire a very easy going temperament and the ability to adjust moving into a new home much easier. 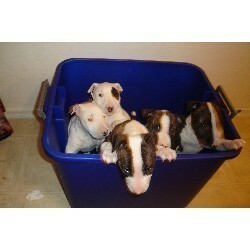 We have 4 females and 3 males ranging from all the colors. Ready to go home.